Know about sterile pharmaceutical production using Blow Fill Seal (BFS) and Form Fill Seal (FFS) technology. Both of these techniques are used to manufacture sterile pharmaceutical products as parenteral (LVP & SVP), infusions, ophthalmic and inhalation products. 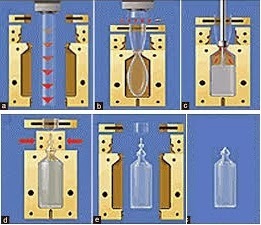 These are automated techniques to prepare sterile products. The basic concept of the FFS and BFS is to reduce the contamination by forming the container, filling and sealing in a closed sterile chamber of the machine. There is no personnel intervention to reduce the chances of the contamination during the manufacturing of sterile products. It gives more production at very low operational cost with the high assurance of sterility. Blow fill seal technology is widely used and accepted by the various pharmaceutical regulatory authorities as US-FDA and MHRA. The system is being used for over 30 years and reported to achieve contamination rate below 0.1%. BFS and FFS techniques are more popular in the United Kingdom than the United States. The process includes various steps, first of all, polypropylene granules are heated at 200 ±30°C to form the tube-shaped known as the parison. Parison reaches to the mould forming the container by the pressure of sterile compressed air. Next, the fill nozzle known as mandrel fills the liquid into the container followed by sealing the neck and filled container is released from the mould. It takes 10-15 seconds to produce one container. The capacity of the machine depends upon the number of moulds. Labeling of the containers is done outside the machine. FFS and BFS machine should be surrounded by class 1,00,000 or better area. Container formation, filling and sealing process is done in a class 100 area within the machine. The system should be validated by media fill runs before starting the commercial production. Can BFS ampoules terminally sterilize by autoclave ? At what temperature, pressure & time period ? what temp the BFS containers are steilised? BFS & FFS machines are to be fitted in stainless steel lined shipping containers having in-built airconditioning and ready to use electric fitting.By arranging the containers one after another,line is ready for production, with appropriate standards.